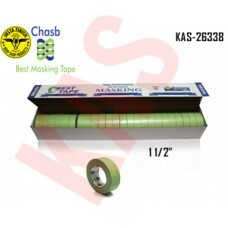 Chasb Performance Green Masking Tape, 1-1/2", 36mmx55M, 24 Rolls, KAS-26338. Chasb delivers consistently superior performance on moldings, plastic, glass, metal, rubber, and paint. The distinctive green paper backing helps improve visibility for more accurate edge alignment and is highly conformable, it resists breaking even around complex contours of a vehicle, making for fast application and eliminating the need to apply additional tape. Chasb green is designed and balanced specifically for superior performance in auto body paint repair and maintenance jobs, reducing rework on a variety of surfaces. The adhesive resists water and chemicals, making it ideal for use with water or solvent based paint systems with no bleed-through, edge curl or lifting. Chasb tape also resists temperatures up to 250°F (121°C) for up to 30 minutes, making it suitable for longer baking cycles. All of this is built into a very low-profile tape which won't leave high edges that require extra buffing or rework yet affordable. You get 24 rolls in a box. 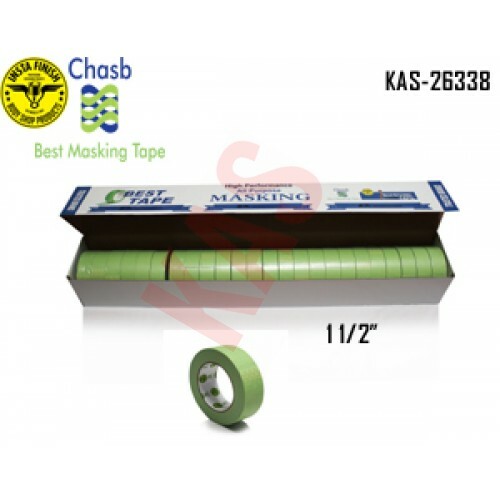 Chasb Automotive Refinish Masking Tape is a Green crepe paper tape designed specifically for the critical paint masking processes used in the collision repair industry. Proprietary rubber-based adhesive delivers instant adhesion to all vehicle surfaces, has good holding power that allows for a fast and efficient application. The specially-treated paper backing offers solvent and moisture resistance that minimizes bleed through; it also delivers a controlled unwind that makes tape easier to handle. The semi-smooth backing is thin and conformable so it produces sharp clean quality paint jobs. With its balanced construction, chasb tape sticks stay and remove cleanly. It is an efficient masking tool that helps save time and money.